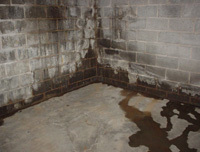 For a Free Estimate on waterproofing your concrete or block wall basement, call or e-mail us today! We service the state of Ohio, including Alliance, Ashland, Cadiz, Dover, East Liverpool, Hartville, Massillon, Millersburg, New Philadelphia, Salineville, Wooster, and Yorkville. At Superior Basement Systems, we've seen this problem throughout the region. For a Free Estimate on a basement waterproofing, call or contact us online today! 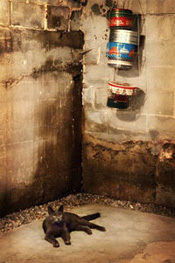 Repairing wet basement walls is what the basement experts at Superior Basement Systems does every day. The basement waterproofing process can be completed in a single day, sometimes two, and usually involves a sump pump, perimeter drainage system, a vapor barrier for the walls, and other products to address any problem in your situation. A battery backup sump pump should also be included to ensure that your sump pump can run during power outages or a blown fuse. 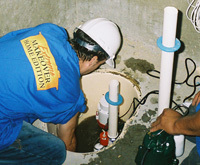 A battery backup sump pump can also offer you protection if your primary sump pump fails for any reason. Click to learn more about sump pumps in Ohio. 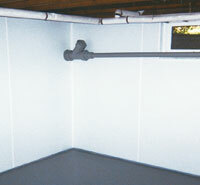 A trench should be created around the basement floor, leading to the sump pump. If you have block walls, weep holes will be drilled into each block cavity at the base. This relieves the hydrostatic pressure in the walls and prevents ground water from filling up inside the blocks in the future. This important basement waterproofing step is sometimes passed over by other waterproofers when they are repairing a leaky basement. A specialized drain, such as the innovative French Drain System provided by Superior Basement Systems, can effectively direct flooding basement water to the sump pump while resisting clogging. A wall flange is included in the drain's design that reaches slightly up the basement wall to drain leaks coming from the wall itself. Laid in a bed of clean crushed stone, the floor is restored flush making for a nearly invisible installation in your home that's warrantied to keep your basement dry for the life of the structure (see full warranty for details). Once the water has been waterproofed you can rest assured that you no longer have a wet basement. However, because water vapor will still be absorbed by the concrete and pass into your home, you may have a damp basement! How can this be addressed? If you live in Alliance, Ashland, Cadiz, Dover, East Liverpool, Hartville, Massillon, Millersburg, New Philadelphia, Salineville, Wooster, Yorkville and would like a FREE, no-obligation basement concrete block wall waterproofing estimate, call or contact us today! Superior Basement Systems of Ohio specializes in leaky basement waterproofing -- we have the experience, equipment, and best practices you need to keep your basement dry all the time! The Basement has been dry to this day. We THANK YOU for the great job.